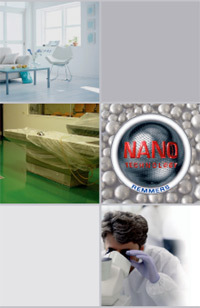 Interior coating on a nanosilver base with an anti-microbial effect for areas with high requirements on hygiene. For high quality interior coatings in areas with high requirements on hygiene, e.g. hospitals, clinics, doctor's surgeries, nursing homes, food processing industry, trade, etc. 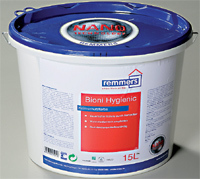 Bioni Hygienic is used for coating ceilings and walls. It can be used as a final coating on all old and new render, wall paper, gypsum plasterboard, concrete, sand-lime brick and fair-faced masonry work. It can also be used to coat load-bearing old coatings on a silicate, silicone resin or dispersion base. Bioni Hygienic is based on the most recent research in nanotechnology and was developed together with leading institutes especially for appli-cation where high require-ments are placed on hygiene. Thanks to its unique combination of active ingredients on a nonosilver base, Bioni Hygienic provides permanently high resistance against infestation with germs and bacteria without polluting the room air. Interior coating on an acrylate base with nanosilver and an anti-microbial effect that per-manently protects coated sur-faces from infestation with germs and bacteria (including staphylococcus aureus, en-terococcus faecium): tested for pollutants (TÜV Certifi-cate), safe for room air from a hygienic standpoint and "rec-ommended for living spaces from a medical point of view" (certificate), water vapour dif-fusion open, "non-combustible" (building mate-rial class A2 according to DIN 4102-1), hard wearing and scrub resistant (wet abrasion class 2 according to DIN EN 13300), resistant to disinfec-tants, good hiding power (class 2 according to DIN EN 13300), free of solvents and plasticizers, good for health and easy on the environment, free of actively fogging sub-stances, low-odour.